You need two things to make breaking putts: 1) a stroke that starts the ball on your chosen line, and 2) the correct amount of speed so the ball can hold that line all the way to the cup. Good line, good speed—nailing one isn’t enough. Even if you aim perfectly to allow for the exact break of a putt, if you then roll your ball too fast, it will miss above the hole. And if you roll it too slowly, it will likely miss below the cup. Think about how you usually go about putting. You look at the green between the ball and the cup and “read” how much you think the putt will break on its way to the hole. You then make a few practice strokes and putt. It’s the same series of steps I followed for the putt in the photo at above right—a 25-foot downhiller on the seventh green at Shinnecock Hills. I read four feet of break from right to left. As such, I aimed four feet right of the hole. After making a few practice strokes to dial in the correct speed, I putted. GolfLogix has always helped you pick the right club. Now it also helps you pick the right line I think most golfers do about the same. Where some differ is in prioritizing the read over everything else. 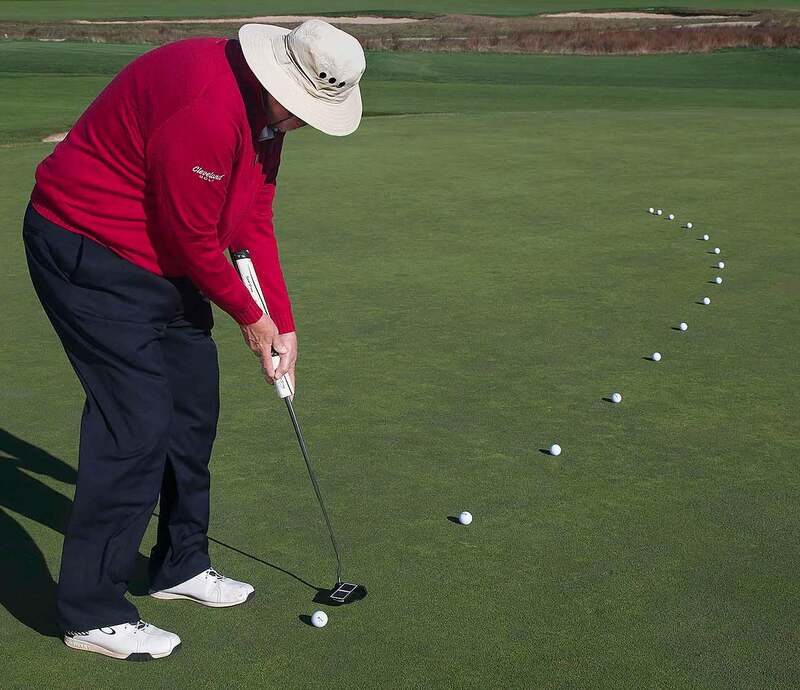 That’s where I emphasize the second-to-last step of the putting process: Matching the putt speed to the break. I take my cues from the game’s best putters, who strive to never doubt the amount of break they plan to play after they’ve read the green. They commit to whatever amount of break they see, and then try to match their putt speed to allow the ball to break that amount into the cup. While it’s true that you need to pay attention to both the read and the speed, neither one has to be perfect. You can make putts at any number of speeds, as long as they’re reasonably matched to the appropriate line. The illustration at the top of the page proves why. Three putts are shown rolling to the hole on three different lines, one ball width apart from the ball(s) next to it. Consider the center line as perfect and the others slightly imperfect. The middle ball is a guaranteed make. The others, the “imperfect” ones? They’ll go in, too, because they’re close enough to perfect to catch the edge of the cup and lip-in. Granted, this assumes that all putts are hit with perfect speed, which for most purposes is one that carries the ball 17” past the hole in the event of a miss. Hit any harder, the ball on the “high” line might lip-out. And with less speed, the low ball would be more susceptible to the “lumpy donut” of footprints around the cup and tend to miss low. Again, you don’t have to read the break or aim perfectly, or even start your putts perfectly on line to make putts. But you do have to be close on both. You have to stroke your putts to roll at a close enough speed to match the break you played. Here’s your homework: On the green, make the last couple of practice strokes with this (and only this) in mind. Focus on matching your speed to the break you read. You’ll start pouring ’em in from all over. And remember, lip-ins count the same as ones hit dead in the center of the cup. Read the break, match the length of your stroke to the speed you need, then putt. The middle step is the most important.